CSI meets Silence of the Lambs meets Saw in Bedlam #3! I’m a big fan of what Nick Spencer’s doing over in Bedlam. It’s a story about redemption, heroism, and morality through the twisted lens of a serial-killer-whacko-nutjob on the therapeutic path to salvation. Of course, that psychological soothing is brought about by an equally insane medical malpractitioner, but Spencer foregoes that storyline this issue to focus on Fillmore Press’ attempts at solving a string a murder of case for the Bedlam City Police Department. Spencer imbues the exchange with a wonderful bit of dramatic irony, as Officer Acevedo assumes the serial murders to be the work of a returning Madder Red, AKA Fillmore flipping Press!!!!!!!! It’s all wonderful, and Spencer, Rossmo, and Csuka are firing on all psychotic cylinders for the third issue in this new series. The opening sequence alone is worth the price of admission, as a mentally fragile Fillmore is subjected to a gruesome companionship experiment during his rehabilitation. What follows is an endless barrage of unnerving and metaphorically heavy crime procedural action. Think Silence of the Lambs meets Saw with a little bit of Gotham Central mixed in toward the end. The script is excellent, and the aforementioned irony makes the cliffhanger at the end of the issue all the more exciting. Riley Rossmo’s artwork is perfectly suited to Spencer’s demented script. It’s naturalistic, yes, but there’s a scratchy quality to the linework that makes it appear as though we’re looking through a cracked glass, reflecting the imperfect morality of Bedlam and our protagonists. Csuka’s color washes are equally effective, as flashbacks are washed in pallid reds or stark whites. Buy it. Nick Spencer and Image have another stellar creator-owned series to follow up on his successful Morning Glories. 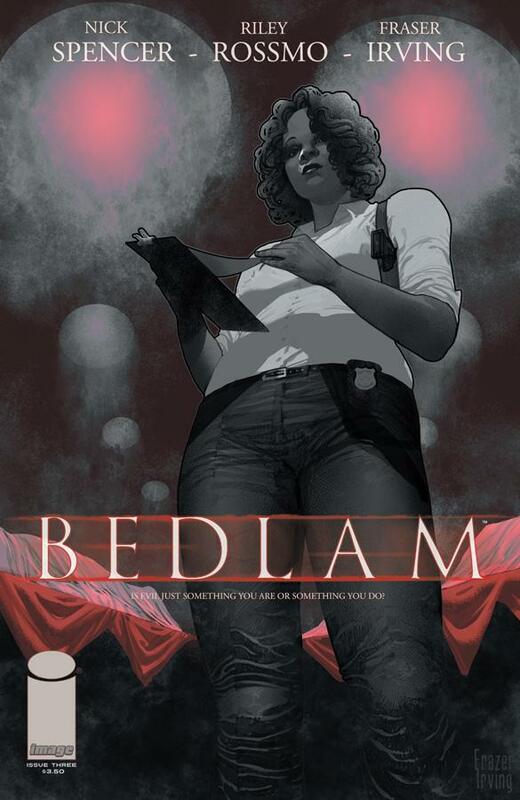 If you’re in the mood for some twisted procedural drama with a tinge of superheroics, chek out Bedlam! I agree that Bedlam is one of my favorite new properties. I probably read the “kitten” scene a few time to let the horrific humor sink in. The art works perfectly for the story.